Hineyni/Here I am in the land of Ireland and I’m walking a few miles down the small lane near my Hermitage, on one of the gloriously sunny days that we had recently. I am singing to the trees and the birds and also saying hello to the unseen Faerie Folk in the dark mossy, wet green forest. I am chanting praises in Hebrew and my heart and my eyes are open. I notice these small purple almost black berries on red stems growing on the side of the road. I reach up high to pick one bunch, and when I get home to my cabin I compare what I’ve picked and verify with my herb books to make sure that I am indeed in possession of elderberries. My joy is great because, yes, I was. I am always careful when I wild-craft (collect things in the wild for consumption). The first time I encounter something in a new place, I will wait to do something with it until I have confirmed, either with my research or with the locals, that it is indeed what I think it is. I always want to check that it is growing somewhere that wasn’t a former dump-site for toxic chemicals. I normally wouldn’t use berries or herbs from a road-side, but this particular road is mostly traveled by sheep, humans and an occasional slow tractor or cars. It’s a small rural road and the elderberries actually are pretty high up, about six feet from the ground. Onward to the wonders of making this magic elixir. It’s quite easy. It just takes a while from start to finish and your presence with the process. It doesn’t make sense to make a small amount of this stuff. First of all, it’s so delicious that you will want to drink it like juice, secondly, it takes hours to collect enough berries to make a goodly amount, thirdly it costs a lot of money in the stores for what you can make at home. Now, if you factor in the time harvesting, the wild-crafted honey I purchased, the fresh lemons, cinnamon sticks, cloves and organic ginger, and I was actually charging for my efforts, the cost of what I brewed up would be similar to what you would pay in the stores. Luckily, for the folks, here at this hermitage, they get it for free. Here’s the thing about elderberries, they are magic, true earth magic. They are full of vitamin C, they most likely will keep you from getting a cold or the flu, if you regularly consume them. If you are already ill, they often will lessen the time you are down. They are super immune boosting. Did I mention that this stuff tastes so good you do not have to fight with your children or your friends to get them to take it? I always make offerings when I am collecting. These berries were a pure gift from the earth. 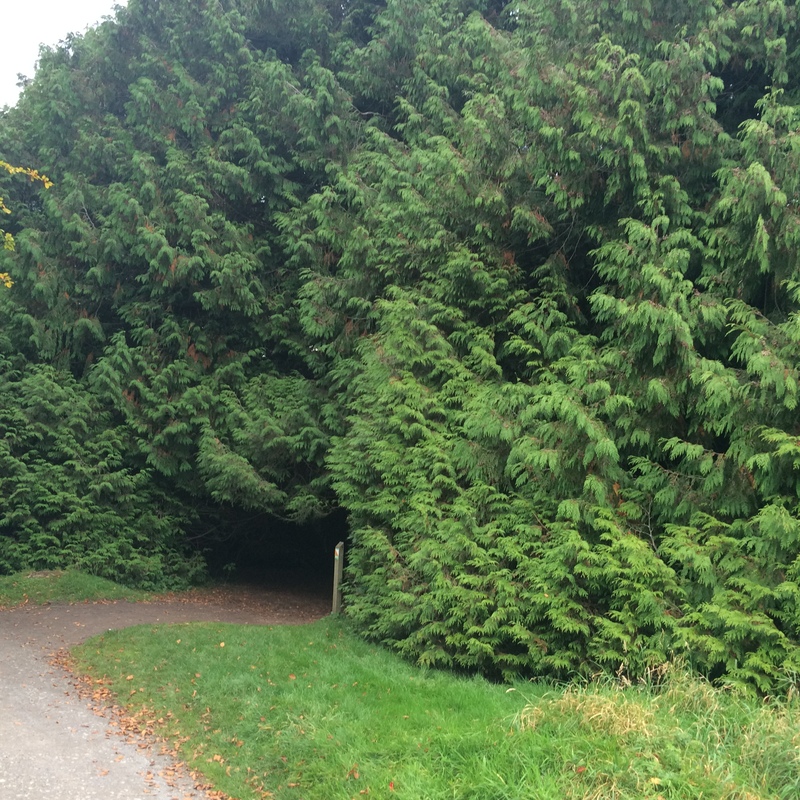 I sang to the trees and thanked them as I picked them from the branches. In general, when I am wild-harvesting or even if I am just sitting in prayer or meditation or I see a glorious flower or bird or have a moment of joy in nature, I make an offering. If I have food with me, I take off a small portion of it and leave it on the ground near where I am or where I experienced my delight. If I don’t have food but I have my glass water bottle with me, that I take everywhere with me and refill constantly, so I never have to buy bottled water, I pour a little of my water on the earth. If I don’t have anything physical to offer, I just touch the tree or ground or water or plant and sing or say “thank you,” usually my tears are flowing with gratitude, so I can offer those as well. I NEVER take all of the berries or the flowers when I am picking for any reason. I always leave a lot for the birds, the bees, and for the plant to re-seed itself. And, yes, right before Halloween/Samhain, let me just come out as the very Jewish-Witchy-Wild-Woman-of-the-Tribe Ha-Kohanim that I am. (I will be posting all about this in a few days, so stay tuned). If you are a praying person and you actually engage with Holiness, however you define that, you can be in relationship with the Earth and the Divine. By being in relationship you can help transform and do Tikkun Olam for yourself and the planet around all that is out of balance and in need of care. Luckily and by the Grace of the Earth and The Creator of the Universe, The MAGIC and Glorious Holiness of this amazing planet we live on is constantly offering itself to us and healing itself. Its berries, its acorns, its boundless gifts overflow to and through us over and over again. Our earth also manages to transform toxins in ways modern science is only beginning to understand. And, as we dance with the earth, and we love and give thanks and engage with and BE in relationship with, not over the earth, we heal ourselves and our glorious planet as well. Okay, back to the recipe, I will actually tell you how to make this stuff, I promise, if you haven’t already looked up somebody else’s recipe by now! Here’s the difference between my recipe and someone else’s. If you actually sing to the berries and you pray and practice for the folks you love and you give thanks while you are picking the berries and you are chopping the ginger and you are stirring the syrup, your elderberry syrup will be more potent and everyone and the planet will benefit more from your enlivened engagement with the process! 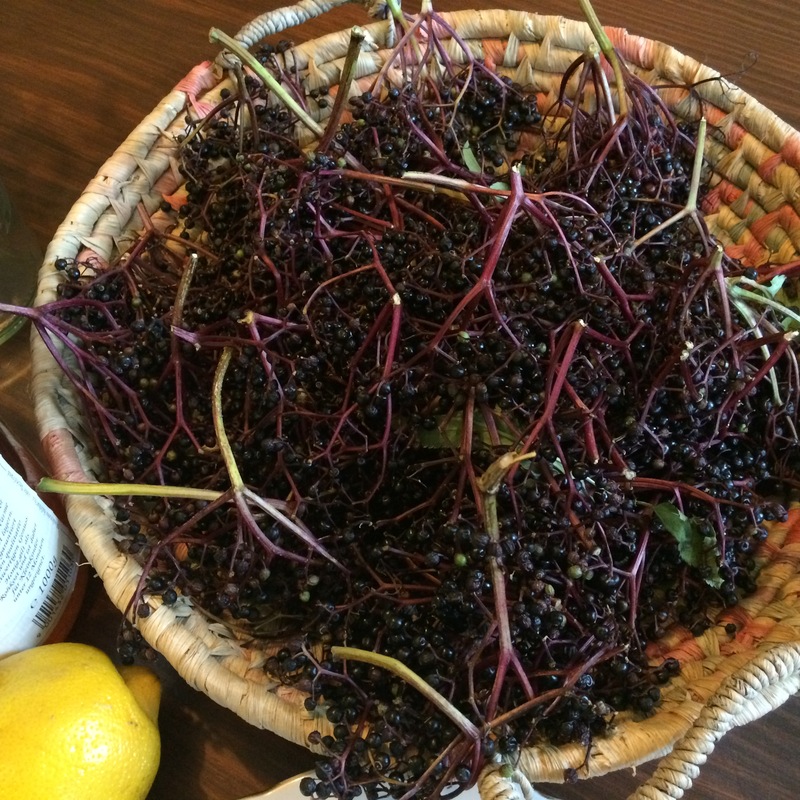 Making Elderberry Syrup with fresh elderberries, or with dried ones too, if you cannot find fresh, (The Actual Recipe)! Remove the berries from the stems into a ceramic or stainless steel bowl. This is best done with a helper, if you have a large amount. It took me and another hermitage member at least an hour to remove all the berries from what I had harvested. I did collect a huge amount, so you might not need that long depending on what you have, but again, MORE IS BETTER. Don’t worry too much if small bits of stem get in your bowl, you will be straining the finished product. Put the berries in a large stainless steel pot and add enough water to cover them and then add about a cup more than that. Add the juice of the fresh lemons. I recommend lots of lemon juice, I used four. You can see in the picture above, how much cloves and cinnamon sticks are needed. I crushed up the cinnamon sticks before putting them in. I did not use all the ginger in the picture, but I used two whole big roots, which I peeled and chopped up very small. Add all of this into the pot with the elderberries and water and bring to a boil, then turn the heat down, cover and let it simmer for at least an hour. You do not want this to be boiling away, the liquid is the syrup. Some folks let it sit after simmering for another hour or two off the burner, that’s a really good idea. If you have time, do that. By the time I got around to cooking this syrup it was getting late and so I didn’t let it sit. I strained the hot liquid into another pot using a fine-mesh stainless steel strainer (NEVER USE PLASTIC ANYTHING NEAR MEDICINE)! Using a bowl and a wooden spoon press down on the pulp in the strainer to get every drop of liquid you possibly can out of the pulp. If you let it sit longer and it isn’t hot, you can also put it in cheese cloth and squeeze and press all the liquid out that way, but you cannot do this when it is hot. Save the pulp for use in your garden or give it back to the earth, please do not throw it in the garbage, it is like discarding something precious. Give what you don’t use back to your compost heap, or if you don’t have a compost, just put the pulp in a jar or container and the next time you are near a river or stream or in nature, return the berries to the earth directly. Add the honey after you have strained the syrup, slowly stirring it in. Stir in a clockwise direction with a wooden spoon. Again, this is a good time to think about healing folks or how grateful you are. Swirl in the bee’s magic and the wonder of the flowers that turned into these berries and made this heavenly purple almost black syrup, give thanks for the rain and the wind and the water. I used a full quart of honey for this batch. Use the amount that works for you based on how many berries you had. Taste the syrup and see if you need more. A note on honey. Most honey nowadays is problematic. It can say wild or organic or local and not really be any of those things. Large bee manufacturers feed their bees sucrose syrup instead of the bees actually interacting with flowers. When you are making medicine, you do not want that kind of honey. Actually, you never want this kind of honey. Get honey that you know is raw, local or that you trust. 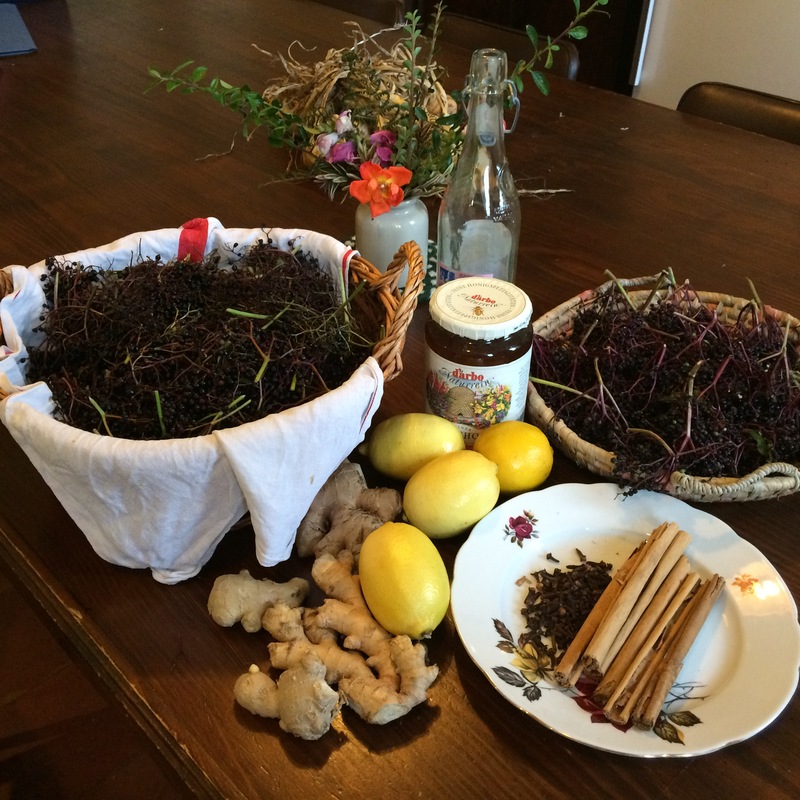 It will be expensive, unless you can trade with your beekeeper for some of your finished elderberry syrup! A good plan! Once you have achieved the proper balance of honey and it tastes right to you, you can bottle the stuff. It’s important not to put hot liquid into your refrigerator. So, let it cool down completely before putting it in a cold environment. Only bottle in glass and use a stainless steel or wooden ladle to move the syrup from your pot to the funnel or bottle. If the liquid is cooled down, basically cold, it is okay to use a plastic funnel, but better to buy and have a stainless steel one in your kitchen. The syrup will keep for a long time, and you’ll go through it before it ever is too old. 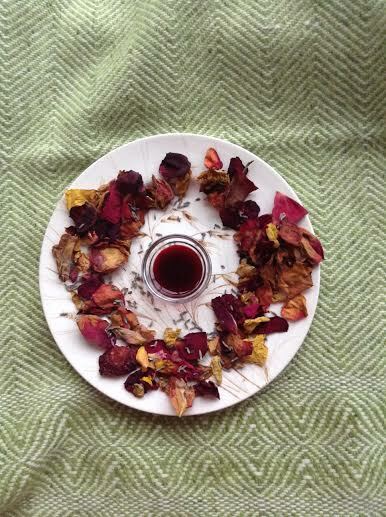 My daily dose, along with the some rose petals and lavender I’ve been harvesting. Stay tuned for rose bead recipe coming up in the future and for the whirlwind of wonderful wild-crafting and doings in the Nicole Zone! One tablespoon a day of this syrup is a preventative, immune supportive kind of medicine. If you start to feel sick, or your beloveds do, increase the amount to two tablespoons and take it every three-hours or so. Do this for two days and you might be able to ward off the cold or flu. If you can’t catch the cold before it takes hold, take the syrup three or more times a day while you are sick and it should reduce the time you are unwell. If you are taking prescription medicines, it’s always a good idea to check with your provider about negative interactions. Most folks do not give children under the age of one anything with honey in it, so check with your doctor about that as well. You can buy elderberry syrup for pancakes, so I really am just warning you to be super safe and careful whenever you take anything medicinally. For, me the warning is not about being fearful of the natural world, it’s about being aware that I do not know everything and that some medicines and some fruits are not good companions. Was this the longest recipe you ever read? Well, good medicine and good magic take time. To the Wild Woods with You, in Wonder and Wandering!